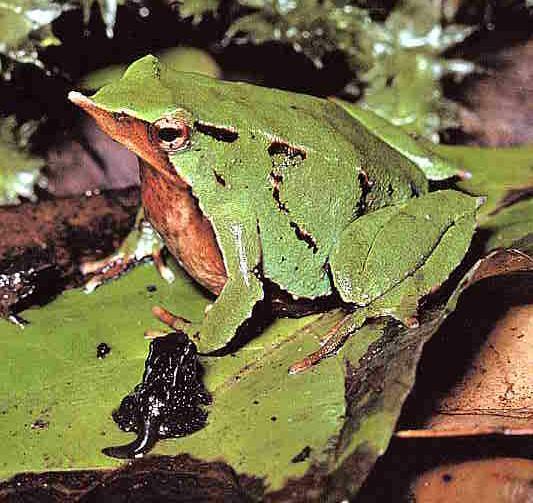 Animal Wildlife | Darwin's Frog | Darwin's frog is named after Charles Darwin who came across it on his famous "Voyage of the Beagle". 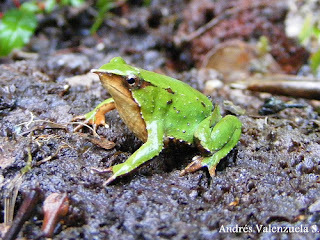 Darwin's frog is a small species of frog, native to the forest streams of Chile and Argentina. Darwin's frogs can be found inhabiting beech-tree forests and fields, in the cooler regions of South America. 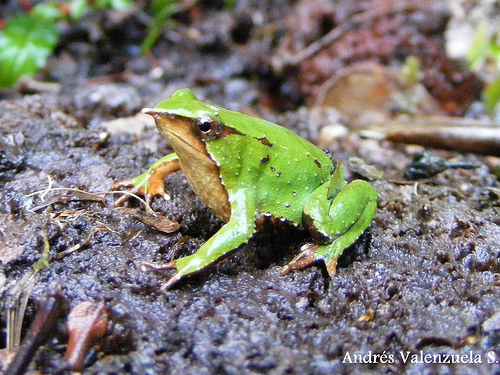 Darwin's frogs can also be found living near and in slow streams and swamps throughout Chile and across the border into Argentina. Darwin's frog has a very distinct appearance, having evolved to look a bit like a leaf. 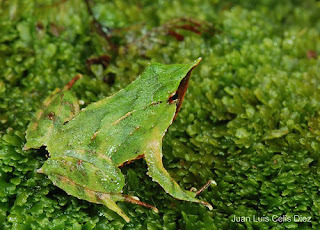 This means that when the Darwin's frog feels threatened by approaching predators, it simply remains very still on the forest floor looking like a dead-leaf until the danger has passed. Darwin's frog is a small, yet round species of frog that has a triangular shaped head and pointed snout. Despite having some webbing on their back feet, Darwin's frogs do not have webbed front feet as this helps them when moving around on the forest floor. Like many other amphibian (and indeed frog) species, the Darwin's frog is a carnivorous animal that uses it's long, sticky tongue to catch it's prey. 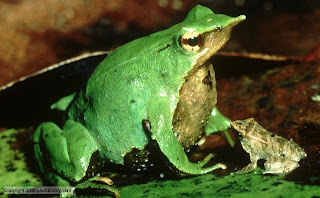 Darwin's frogs feed on a variety of small invertebrates including insects, worms, snails and spiders. Due to it's small size, and despite it's best attempts at blending in, the Darwin's frog has a number of predators in it's native habitat. Small mammals such as rodents, snakes and birds all commonly prey on the Darwin's frog. The Darwin's frog is well known for the way in which it takes care of it's young. The female lays her eggs, which are then guarded by the male for about 2 weeks. Once hatched, the male Darwin's frog carries the developing tadpoles in a pouch in his throat until they are tiny froglets and are able to hop away. Today, the Darwin's frog is a species that is considered to be vulnerable from extinction mainly due to habitat loss in the Darwin's frog's native habitat, primarily caused by deforestation. 0 Response to "Darwin's Frog"